Because tomorrow is Jim Henson’s birthday, my weekly series on vintage board games has a Muppety flavor this week. Game Box: A colorful cartoon rendering of every Muppet imaginable. That’s why I bought this game for my daughter. She loves Janice, the Electric Mayhem’s female member, and it’s rare to find merchandise that includes Janice’s picture. Not only does this box feature Janice, but the game board does as well! Most Interesting Feature: What I didn’t realize when I bought this game is that it was made in Canada and has a bilingual board–one side in French, one side in English. I actually felt a little peeved when I opened the box and found a French board. I only speak un peu de French and didn’t know how I would manage to play this with my daughter. When I flipped the board over and found the English side, I no longer felt peeved—just stupid for not noticing the French writing on the box. Game Pieces: Rather lame. You know how some game pieces have a plastic base, into which you slide a cardboard picture? Well, that’s what this game has, but the cardboard pieces don’t display characters—just colors. There’s a yellow one, a red one, a green one, and a blue one. Why not just use regular colored-plastic markers? Game Play: The game designers came up with a concept relates well to The Muppet Show and its characters. 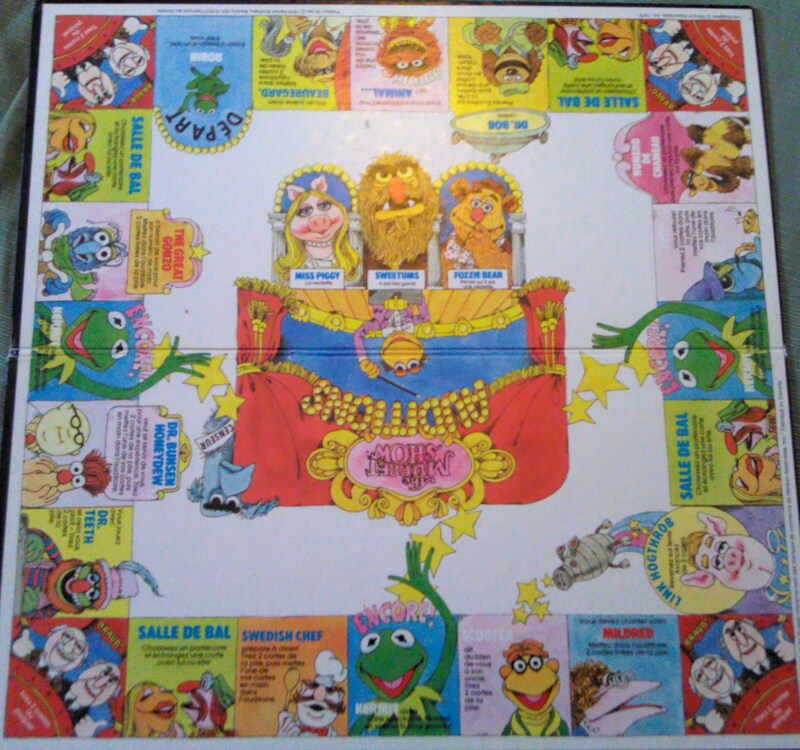 Players move around the board and try to collect cards representing three judges—Miss Piggy, Sweetums, and Fozzie. Once you have all three, you can “perform” for the judges. That involves picking one of six Sam the Eagle cards and hoping that it doesn’t match the number your opponent rolls on the die. If you don’t match Sam, you receive a star; seven stars win the game. The rules have a few wrinkles—such as allowing players to “upstage” each other—that keep it from getting too repetitive. Sam is one of my favorite Muppets, so I enjoy his role as censor here. 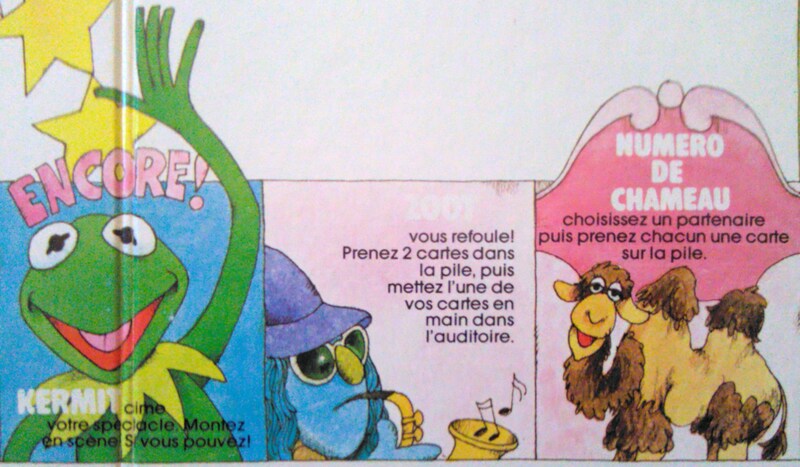 My Thoughts: I owned a different Muppet Show game when I was little, one that dated from 1977. I don’t remember much about that game, but I can endorse this one as fun for young Muppet fans. 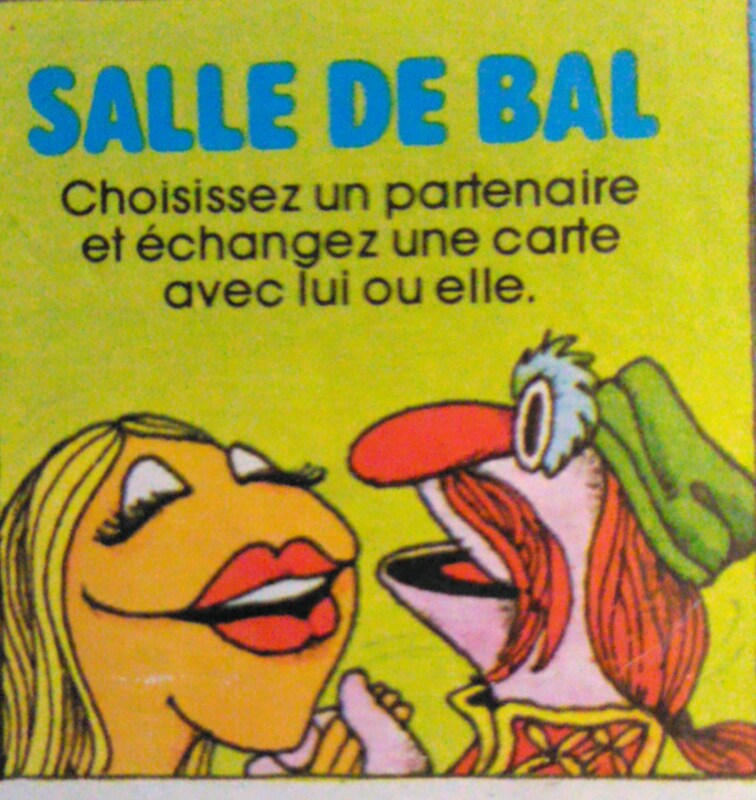 This entry was posted in Spin Again Sunday, Television, Toys and tagged 1970s, 1980s, Board Games, Games, Muppets, Nostalgia, Toys, Vintage Toys.